When I started blogging I had no idea that it would lead to the most adventurous, amazing ride ever! It’s been 6 years and I feel as excited about blogging as I did the very first day I started! But I’m not a young buck in the blogging world. No! I’m one of the more “mature” bloggers. In a field where young is admired, I have loved busting through glass ceilings and doing things that I have been told I would never do! For the next 10 week, some over-50-bloggers are sharing a little bit about themselves and the fabulous world of bloggers of a certain age! Between The Lines is a blog series that is the brain child of the darling Katherine from KATHERINES CORNER. What a great idea to give voice to women who work as blogger and are over 50. But don’t let our “maturity” fool you . We are young and vibrant and active and engaged and we do it with wit and wisdom! Kathrine is a prime example of being fabulous and over 50! If you don’t know her you will want to. I think she is elegant and so so kind! You will love her blog! She asked me to answer a couple questions to get my “over 50 perspective”. WHAT TV SHOW MAKES YOU STOP, SIT DOWN, AND WATCH? This is such an easy question to answer! Fixer Upper, of course!!! Doesn’t everyone love Chip and Joanna and their amazing home transformations! I don’t know what I like better… Chip’s antics, the relationship between Chip and Jo, the inexpensive price of housing in Wako, the happy tears of the new homeowners, the overall transformations or the one-of-a-kind details! Fixer Upper was made for me! I think my Bobby is very much like Chip! Do you know my Bobby can be just about as funny and ornery as Chip? Yes, I could see him doing so many of the shenanigans Chips does! And it’s f-u-n living with a man like that! I think there is a great lesson to be learned for those of us over… er… 50 from Fixer Upper! Fun, style, panache and loving our homes should not stop as we age! I’m watching Fixer Upper because it inspires me! I watch it because I love love love home decor. I watch it for ideas! This is my wheelhouse! We, those a little more mature, might need “readers”, and take a pill or two , and ache just a little more than we used to. But we also have a wealth of knowledge to call upon and probably have more time to spend and might have more disposable cash than we did when we were new homeowners. We should be keeping our homes as fresh and young at heart as we are! Why should our homes be stuck in the 80’s or 90’s when we aren’t? WHAT’S ONE THING THAT HELPS BOOST YOUR READERSHIP AND WHY? There are so many things that can boost readership, but I think the number 1 thing I try to do is build a StoneGable community. It’s really not a strategy to boost readership but it does! Instead, it comes out of a heart of wanting a real relationship with my readers. I’m a real inclusive person. I say, “more is better so join in”! Every post, tweet, facebook shout out, Instagram and pin I do with my readers in mind! I genuinely love and care about them and I think they can feel my affection for them coming through each post. I want my readers to feel welcomed and I want them to say, “Wow, Yvonne must have created that post just for me”! I LOVE that! I want reader-friends from 18 to 80 and beyond! Just because I’m over 50 does not mean that my posts don’t resonate with younger home decorators. I strive to be my readers best cheerleader! The one who says, “Give it a try, I KNOW you can do it”!!!! And, “YOU GO GIRL”! I think my readers feel like I am a friend, a sister, mom, aunt or next door neighbor. I love to get their honest comments and emails and hear what they are thinking. I know many of my readers by name and am so thrilled when they comment and join in the conversation at StoneGable. My readers have a lot to say! And I listen! Don’t you think people will go where they feel most welcomed and inspired? I sure do! Who knew that in the second half of my life I would have the job of my dreams waking up every day excited to learn and explore and grow in many areas! Doing something you love keeps you young and purposeful! Here’s to women (and men) who live “between the lines”! Again, a big THANK YOU to Kathrine for including me in this great series! I love your blog. You inspired me to redo/ update my 35 year old home. We did a true makeover. Tore down walls, all new flooring, and several new pieces of furniture. My kitchen looks a lot like yours. Black and white and I love it. I also love your weekly menu. My favorite thing about you is your love for God and how you share it. I just read about the different names of God. I am going to take your advice and learn them. Thank you so much. So lovely to meet you via the “Between The Lines” blog series! I love the homely feel of your blog & I’m so pleased the series has introduced me to some awesome blogs such as yours! I think your photography is pretty good ?? Thanks so much Linda! Welcome to the StoneGable family! I’m still playing catch up with meeting everyone, Yvonne! I’m so happy that there are that many of us, and even more who are 50 and over, blogging, and loving it! I remember reading your posting on displaying family treasures and learning your great-grandfather was Hungarian. Both sets of my grandparents came to America from Hungary and I also have letters and books written in Hungarian. Anyways, I just wanted to introduce myself and tell you how much I truly adore your blog! It’s true that you reach everyone at every age. I won’t be featured until next month. Have a wonderful week! I’m scrolling through the comments thinking, wow, what a great community! Great to meet you. Hi Shelia, Thanks! We do have a wonderful community here at StoneGable… I’m so glad you are joining in! Wow – so glad to hear from readers who are in my age bracket – over 70. Somehow I thought I was the only one. 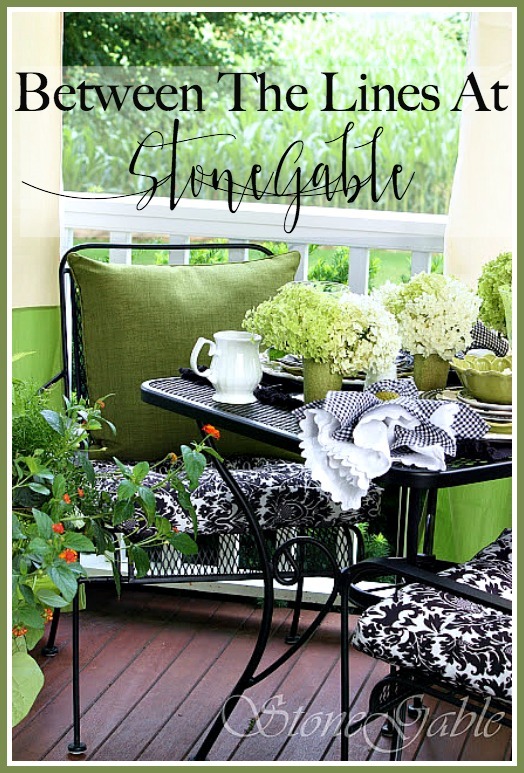 I love to keep my home updated and beautiful yet one that is lived in – just like StoneGable. We built our downsized home 7 years ago and do I ever wish I had this blog for reference then. We made many mistakes that cannot now be corrected but I find so many ways to compensate and cover up in your blog – thank you for all the lovely ideas. I’m in the 60’s group, and just now retired and working on clearing out and updating my home. I don’t have a blog, but I love getting the post to yours each morning in my email. I have my cup of tea, while reading, and then start looking to see if I can duplicate whatever your project/activity was for the day. I don’t have the living space you do, but I find many ideas I can use in my home. Thank you for all the inspiration. This is such a great post! You have been a huge influence to so many and your blog is beautiful and delightful. 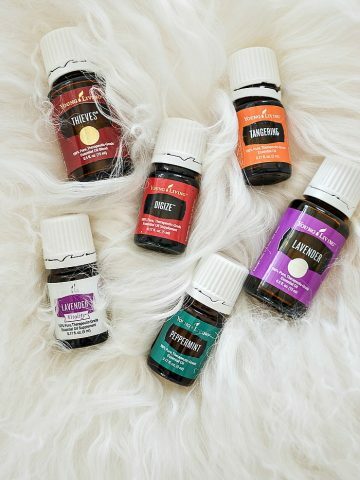 I first found it through a pin on Pinterest and have enjoyed following you along creating beauty in your home and life. I’m a relatively new blogger, though just doing it for creative fun as I learn the ropes. I can’t believe I turned the BIG 50 a few months ago. It’s just a number and I don’t feel “old” at all. I think it’s a matter of the heart attitude! Blessings to your weekend and keep creating beautiful posts! I too am over 50 and recently discovered this blog. I really love your style, so clean bright and fresh and enjoy reading your blog.When so many publications seem to disregard and even disdain opinions of anyone over 50 it feels great to have a place to go for encouragement and ideas. Kathleen, welcome to the StoneGable family!!! I am not 50 yet, but close! I always love reading your blog. You give such great advice and I love your style. This is such a great series! Hi Yvonne! Great to meet you through the Between the Lines project. I’m Sue from Sizzling Towards Sixty and I live in Brisbane, Australia. I am so enjoying connecting with wonderful women of midlife. Have a great day! Always enjoy your blog and delighted to see you in Bloggers over 50! It’s inspirational and encouraging to see other “mature” people blogging and adding their own expertise touch to others’ lives! Hello Yvonne – I have followed you for several years and the timing of this post is uncanny. I actually started my blog the same time I turned 50 last year. Although my blog is still less than 6 moths old, I have met some awesome individuals with wonderful spirits of all ages. I, in no way, “act” my age and probably never will. They will be turning my music down in the nursing home guaranteed! Thank you for sharing such beautiful thoughts and I look forward to many continued visits. Stopping by to say hello from a fellow Between the Lines blogger! I LOVED Magnolia Market too – so glad that I live close enough for a day trip. Love your style! Your sincerity shines through each and every post. …I am in the over 60 group! Hi Yvonne, I love your blog! I’m an over 50 blogger. Thanks for sharing “Between The Lines” from Katherine’s Corner. We have plenty to share and some experience behind our belts. I recently took a trip to Chip and Joanna’s Magnolia Market and I blogged about the amazing time while I was there. Here is the post. http://www.mjonesstyle.com/?p=6578 Enjoy! Hi Yvonne, I love your blog and the topics you are loving to share, I love to read your inspiration and your positive outlook!. Its neat that you connect with all ages of women and to share your knowledge. And I am enjoying the Between The Lines series each week, such a great way to meet others of the same age, such lovely ladies! I am following you now on Bloglovin, Twitter and Pinterest. Hi Karen, Did you sign up for my daily newsletter? I sure hope you do. Go to the very top of this blog page and look for a box in the header that says “free email updates”. Add your email and confirm your subscription when it come to your inbox. I know you will love the daily dose of StoneGable features and other posts. Love your style, ideas, and posts! I am over 50 too, close to 60, and own a gift shop and wedding design business. Working with brides keeps my ideas fresh and keeps my thinking “young” but I totally agree that being “older” means lots of experience which comes in handy so often. Thanks for the beautiful pictures and posts! Hello, Yvonne! Your blog is my FAVORITE! It’s the only one I absolutely must follow daily. If I don’t, I feel like I am missing something. I’m so excited to tell you that this weekend I am actually going to Waco to visit Magnolia Market! I haven’t been yet (I live an hour and a half away south of Waco, near Austin) and my favorite HGTV show is Fixer Upper as well. Who doesn’t love Chip & Jo? I also love what they have done for the City of Waco. It is now attracting more shops and restaurants in that area, and improving the city in my opinion. I’ve seen the silos from the Interstate, but this will be my first actual trip to Magnolia. 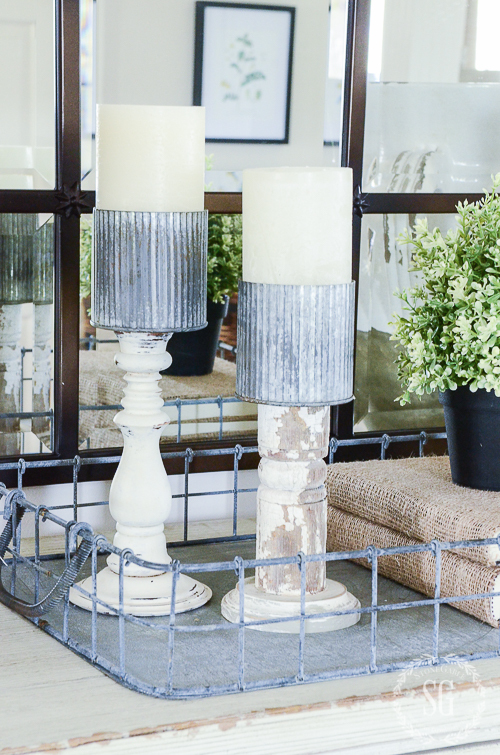 I know I’ll go nuts in there, because I adore their style – Farmhouse style like yours! Thank you for all you do, your hard work and inspiration. I certainly feel like you’re a friend! Oh, Karen! How wonderful!!! If you see Jo give her a hug from me! Have a fun time and take lots of pictures! I’m writing you from Belgium, but I’m French ( and 53). I don’t speak very well amerian language and Inever went to USA, but I like so much your blog, your house (home) is very beautiful. Thank you very much for your job! Merci, Isabelle! I love my Belgium friends. So sorry for the losses in your country. I’ve been praying for you! HUGS! Back in my life. When I read your blog I feel like I’m talking with a close friend.. Thank you for being a friend and for your encouragement. Pamela, we are friends! You are one of the wonderful readers that I look for every day to leave a comment and to connect. Thank you so much for your kindness and encouragement. You are a blessing to me! HUGS! Hi from a fellow Between the Lines blogger. I am super happy to have found your blog! I am 66 (next week) and I LOVE LOVE LOVE decorating and design. I am a Color Consultant and dabble in interior design. I am gonna check out your site for some ideas as we will be decorating our new place in Costa Rica soon. Hopefully I will find some ideas I can use. This was a great series that we participated in and I hope that we can all support each other. So glad to connect with your Devon! I’m closer to 60 than 50 (my goodness, how did that happen) and we recently unsized to a new home. After moving all over the south, I’m so excited to have the home I’ve waited for all along. 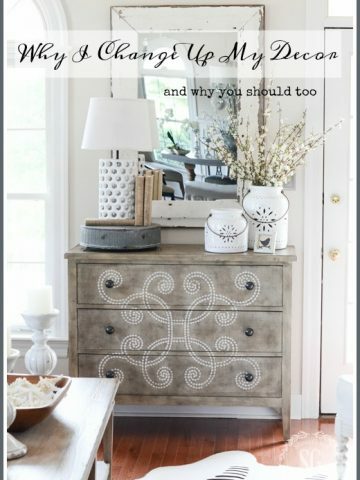 I appreciate your blog and while I love the diy, I don’t want my house to look like I have to do it myself, just a few things to show my personality. Love, love, love updating my decor for seasonal and holiday changes and I love how your home makes a nod to the season or holiday in non-traditional ways or colors. HiYvonne. Really enjoyed reading this post. Your blog is one of my favorites and I look forward to reading it every time. It is firstly, beautiful! Love all your creative ideas, recipies and your beautiful home! I love home decor and you always give me great ideas! Keep on bloggin! I don’t intend to stop, Lord willing!!! Hi Yvonne, It’s me Sherry, remember…I feel a connection, and I still do! You probably don’t, but you will. Wow, the response you received from this post tells me there are more “mature bloggers” than I thought there were. This is sooo encouraging for me to get started on mine own blog. I too have been reading your blog for awhile and have been inspired from it. Can’t wait to get my blog off the ground and running! You have been a blessing to me and I thank you and our Lord Jesus Christ! Hi Lynn, Welcome to the StoneGable family!!! So nice to see a familiar face in this series, Hi Yvonne! I’ve been admiring your beautiful work and impeccable photography styling for awhile on social media and various spots in the blogosphere. 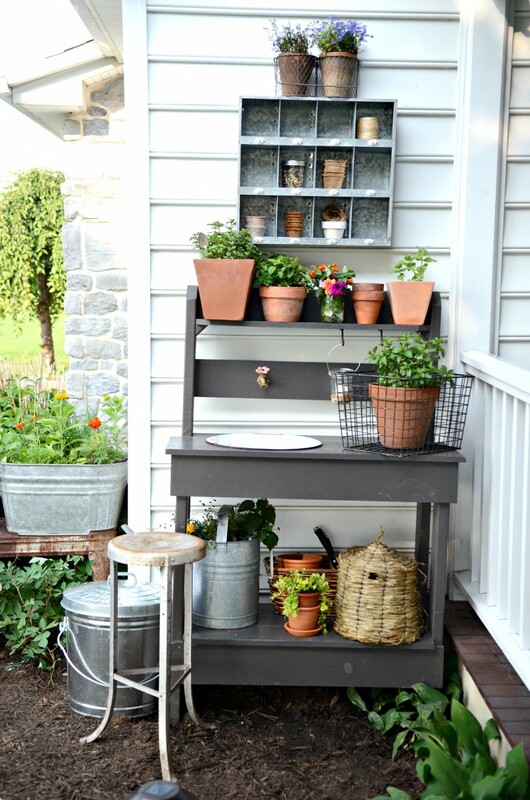 It’s always nice to see other bloggers in our DIY Home & Garden niche, especially in our age group. I’m glad to be a part of this series with you. Right back at ya’ Marie! Yvonne – you are every bit of that and more. You are one of my very favorite bloggers, have been for years. Keep up the good work – and thanks for being uch an inspiration for me, for so many! First, Welcome to the StoneGable family Cat! And second thank you so so much for sharing your story! YOU ROCK! Hi Yvonne, I saw you on the Between the Lines Blogger Series. I’m so happy to see so many bloggers “our age.” Your photos are just lovely! I’m going to have to peruse your blog for ideas. We are at the beginning of a total reno on our poor little 1970’s home. I can certainly use the inspiration! I look forward to meeting you! So happy we have connected Carla! Keep those blogs coming, I love your “maturity”! Hi! I’m Marilyn from marilynstreats.com. Nice to meet a fellow Between the Lines Blogger! I will add you to my Facebook! I’ll do the same! So happy to meet another fabulous over 50 blogger! I appreciate all the over 50 bloggers, as I am a over 60 reader ! Just because we are older doesn’t mean we are not interested in making our home beautiful. Hi Yvonne! COngratulations truly for your amazing blog in which we can feel so much love, energy and passion! You’re a very inspiring blogger and I sometimes ask myself if you don’t have a creative idea every minut? And it’s really a pleasure to be able to get to know people from around the world from any age, any country and culture! So sweet of you Claire! I love your blog too! Yvonne, your blog is always inspiring to me. I mean that literally. Yours was the first blog I happened upon. I found it during a time of experiencing a devastating crisis in my life. In my grief I found you. Or maybe I should say, God led me to it. I have spent many happy hours looking, reading, and enjoying your posts and archives. Never underestimate the influence and inspiration you spark. I love love love your blog. Always have. So, thank you from the bottom of my heart. I could go on and on and give you many examples of the ways this blog has motivated and lifted me. But, I won’t because you are too busy for that. Keep up the wonderful job! It brings all of us such JOY! Happy Day, Yvonne. Hi Yvonne, I am a new over 50 blogger and I found out about you through the Between the Lines blog series. I cannot wait to browse your page and catch up on everything you’ve been doing. Looks like you’ve been at it a while! It’s so nice to meet you through “Between the Lines”! PS….I am so thankful for the updates on your son. I have prayed for him by name, petitioning Our Father for a full and permanent recovery. I am so VERY sorry to read of your back-surgery injury, Pamela. How devastating!! I can’t imagine what you went through after the surgery!! While I’m not disabled, 23 years of back problems has certainly affected my life. I truly know and understand the frustration and depression. I hope that by following decor blogs, such as Yvonne’s, you begin to feel an enjoyment and a renewed interest in life. Having a lovely environment is even more important when your physical condition makes you more housebound than others. I wish you much good luck in the future and keep reading Stone Gable. I’m an over 50 blogger too! We have a lot of insight and experience to share! I love Fixer Upper, too! Love Chip and Joanna! I like your style very much. I’ve always been a cottage style girl, but I love English Country, some French and Farmhouse, too. I am in the beginning stages of refreshing our home. We do not want to live in the 80’s! Lol! I love your blog. I have a few favorites and yours is one. Keep doing what you do. I love it. Fabulous! I am a few months away from 50 and found your site by accident while I was pinning things for my daughter’s Bridal Shower. I have never subscribed to a blog before but now it’s the first thing I search city each morning. I have also never been a crafty person before and you’ve taught me I really can make beautiful things and make a beautiful home. I love love love everything about your blog, your inspirational aspects, crafts, and tips. Thank you so much for opening your world and sharing it with mine! Happy to have found your blog and meet a fellow blogger in the Between the Lines series.I’m having such fun learning about these many new blogs! Look forward to reading more! I’m sorry I don’t comment often, but I really love your blog Yvonne and your style and decor. 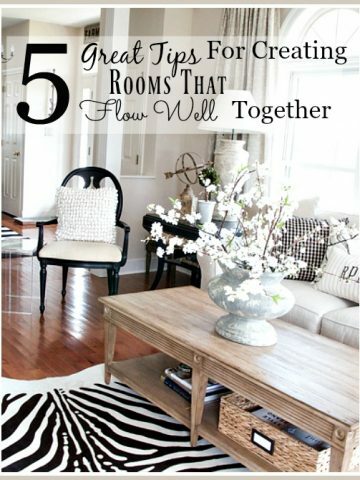 I’m also over 50 and we share a similar decorating style, which is why I love your blog so much. You’re such an inspiration and I always look forward to your blog to see what you’ve DIY’d, created and styled. Everything always looks so magazine worthy. I first discovered your blog through a link that was on a Joss and Main email. I have been reading ever since! I love your blog and finding that you are also a sister in Christ made it even better. I just turned 60 last year and recently retired from a demanding and somewhat stressful job. I have been doing lots of what I LOVE, which is projects around the house and entertaining. It is fun to have time to try new things and rewarding to check those long postponed projects off my list. People kept asking if I would get bored…are they kidding??? Yvonne, keep doing what you do, you do it very well indeed. NOW you can really do what you love. Happy retirement from stress Nancy! Your fun job has just begun! I love your blog and read every post. I will be so happy to read blogs from over 50 ! I’m in that category and the things they blog about are more relevant to me. I do enjoy several younger bloggers, it’s just nice to see some from my peers too. I too would stop and watch Fixer Upper. Absolutely love all of it and am astounded by the prices too! I live in Halifax Nova Scotia. However our home is up for sale as we are downsizing.we surprised ourselves as we fell in love with a log home for our new home. I don’t want t do rustic or “cabin” style, I want stylish and yet appropriate for the lg home. I’d appreciate any ideas from you and your readers. All the best ? I love readers from Nova Scotia!!!! Your new downsized log cabin sounds divine! I might go all neutrals and lots of great texture. Let the walls be the star!!!! Thanks,Yvonne for today’s blog. You were my first blogger that I started following. I look forward everday for inspiration from you. You are like an old friend I could set on my wrap around porch and have an afternoon of good conversation. 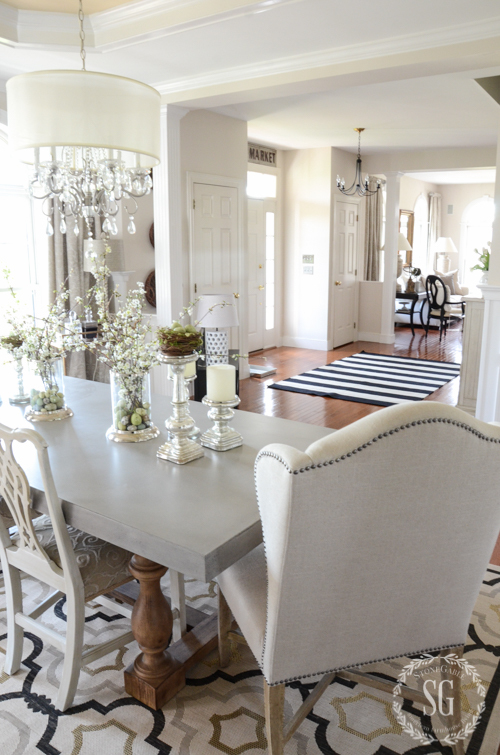 I love your beautiful farmhouse style of decorating and your christian faith in the Lord. ALL you do and share with us. Love to keep up on anything new or interesting. Just because I’m 80 now doesn’t mean I am less interested in what is going on in the world – have always loved decor and eat up any new changes! LOVE your spirit Shirley! You are so so right! I am over 80 and I keep my house as up to date and fresh as I can. I found that I can go to resale shops and pick up pretty things for the home and I resell them or the things I am replacing if they don’t meet my needs anymore. Right now we are looking for a new home to be closer to our doctors and children and I can’t get over what condition people leave a house to be shown. I refuse to even look at them. I am freshening my home for the next person who lives here. I have no clutter and walk thru the house each evening to pick up and neaten it before we go to bed. My husband loves Fixer Upper for Chip and his antics. Age is just a number on the calendar. Hi from Canada, Carol! 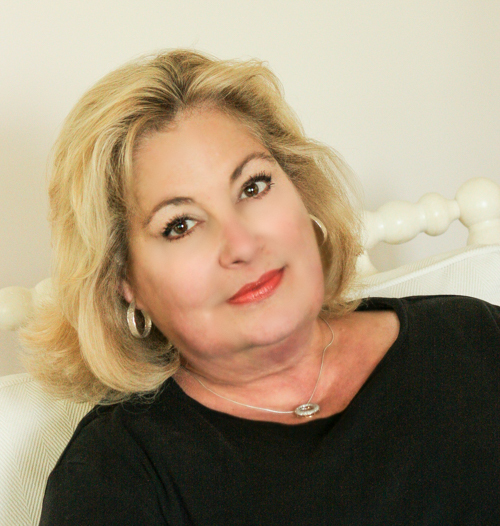 I’m 77 and like you, feel my new home (a condo) is as up to date – without following fads!! – as anyone else’s. i don’t mean that to sound like a silly “competition” but just to state that when we get over 70, it doesn’t mean we all have doilies on our furniture and under lamps! (I hope I don’t offend any doily lover!) I change vignettes often and constantly look at my rooms with a very critical eye ensuring I don’t have too much “stuff” in a room but keep it pare downed yet, at the same time, interesting. YOU GO GIRL!!!! I just L-O-V-E your attitude! I want to be like you when I grow up! Amen Carol! I am 71 and it is just a number; its your spirit and mindset. Fixer Upper is one of my favorites, too. and decor I always wanted to have before, so know you will have fun! Thanks for your post and God bless! I am an aspiring blogger and have been inspired by your blog. l love it. I am preparing to retire so I am a tad over the 50 mark but I believe that age is truly a state of mind. You are so correct when you say “we have a lot to contribute” we do we have learned our lessons the hard way basically because the internet was so different not that many years ago, that being said many of those lessons stand us in good stead now. Have a great blessed day. This series is just what I’ve been waiting for. I’m in my 60’s and am always searching for the “more seasoned” blogger. Can’t wait to add these bloggers to my reading list. Love, love, love your style. Thank you for being here every single morning. Donna, it’s my great pleasure! I love your blog and I am in my 60’s. It is the first thing I read in the morning and it gives me inspiration I didn’t know that I had. I am working on a living room redo right now. Keep the ideas coming. I’m just shy of 60 and LUV your blog. I follow about a dozen bloggers, but yours is by far my favorite. Your home is so warm and inviting, (I wish we were neighbors) that i’m sure your family and guests just love being there. You offer some many practical solutions to everyday problems, that i’m now finding easier ways of doing things, myself. Keep up the great work, Yvonne. You’re doing an awesome job. Yvonne., Stonegable was the very first blog I started reading and following. You are still my favorite even after adding more blogs to my list to read. Your style and taste in your home is very similar to mine so I thoroughly enjoy your inspirations. Here’s to blogging for many many more years! Yvonne I love your blog! I am inspired everytime I read it! Here is to us ladies who are between the lines!! Just entered into the 70’s; not only do I have lots to share, but enjoy learning something new every day. Your blog helps me achieve that! Thanks for being an inspiration. Shirley, YOU are an example to me of what is great about being over 50! I love you and your blog dear friend! I have just jumped over the 50 mark 🙂 It’s not so bad. I am young at heart and chose to live one day at a time… filling my life with joy and happiness. Always a challenge to be taken . I luv your blog! Your zest for life and beauty. Your luvly home is an inspiration to us all. I am also in my 60s, and am really enjoying life so much more now. With age, you learn to let go and let GOD! You are a prime example of that. I thank you for sharing your life and wisdom with us all and look forward to many more years as your reader/follower. “You go girl!”…. You have inspired me time & time again, and I thank you for all your beautiful words of wisdom. You are right when you said ~ sometimes the post seems like it was put there just for me. Thank you Yvonne for all your patience and love. Susan, I’m so blessed by your friendship too! I am admiring the candles on the galvanized tray. What are they wrapped in? Metal or paper? Was this a DIY? I loved the holders made out of tuna cans and burlap. So simple and I love both looks! Hi Barbara, I got those at the Luckett Spring Market last year. I am trying to figure out how to replicate them. They are galvanized metal and seem to be soldered together. I am in my 60’s and you inspire me daily with your energy and excitement for life. You are a wealth of information and have encouraged me to attempt new and interesting projects. You are never beyond an age to begin a new adventure! Many thanks for all you contribute to our lives. Oh, Doreen! I love to hear what you have to say. I’m a teacher by trade and by heart! It’s as if I cannot help spilling out what I know. It’s like I can’t wait to share the next great idea that might inspire, teach or bless someone’s life! I love hearing your thoughts, Yvonne. You’re such a beautiful example of doing things with class and grace. I think it’s wonderful that in the world of blogging there are women that are mentors to the younger women. And you are certainly one of them! I haven’t quite got to 50 yet, but it’s not many years away, but you know what, I don’t think it will bother me one bit! I’m loving life and most of all I am loving blogging. It’s all about the relationship with the readers, loving what we do, sharing, but it’s more than that, as you say, quite brilliantly I might add, it’s about building a community. It’s the readers who make it all so special and the compassion and friendship between bloggers. I am incredibly lucky to be able to call myself a blogger, for the friends I have met and for the opportunity to share our French lifestyle. Here’s to bloggers young and old and 50 is still really quite young! I so agree, I was thankful that I made it to 50! Honestly, I’ve been so blessed! Each new year is another year to live and grow and love! I am one of those over 50 readers and now a blogger. You are an inspiration for us all. You are a beautiful person with a beautiful home. Thank you for sharing a little bit of your life with us.